At Muñiz Academy, we believe that all students are capable of excellence as scholars and citizens. We also believe that students and families are partners in creating a community culture of engagement and excellence. Student progress will be measure growth on specific learning targets as well as habits of learning and scholarship. Families and students will understand student progress in a wide variety of ways. 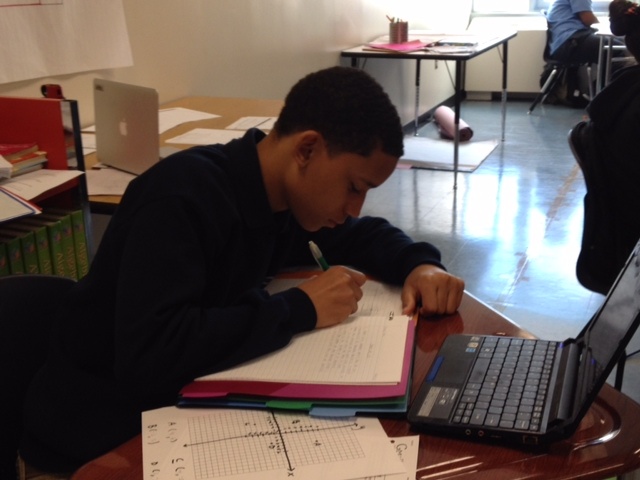 Students are expected to develop the habits of citizen scholars throughout all of their experiences at Muñiz Academy. We believe these habits are essential to becoming fully prepared and well-rounded citizens and scholars at Muñiz Academy and beyond. Our RAICES include responsibility, advocacy, integrity, compassion, excellence, and stretch (going beyond). Student’s ongoing work in class, homework, and course assessments will be used as evidence of learning and growth. Staff and students organize exhibitions of student work in each content area. Families, community members, and our partners will be invited as our authentic audience to celebrate and honor student learning and our work as a community. All incoming 9th grade students complete a language assessment test, reading test, and numeracy skills test during the summer induction program. All students are retested at least once per year using the same assessments to evaluate growth over time. Students will take standardized assessments as mandated by the state, and this data will be used as one measure of school effectiveness. Grades are used to communicate about skill and content understanding. Grades describe student’s progress towards a set of long-term learning targets that students and families are aware of at the beginning of each term. Grades reflect a student’s current level of proficiency with skills and content rather than an average. Grades on content are separate from habits of scholarship levels. Success in both is required for credit, promotion, and graduation. Students will earn two grades for every course. Success in both is required for credit, promotion, and graduation. Levels of achievement are used to communicate student progress on meeting Learning Targets. Learning Targets are goals or objectives for lessons, projects, and courses, derived from the state standards. Teachers and students use the targets to track progress in learning. Students and families will receive a progress report by the middle of the first semester. Progress reports will be a short narrative with the interim grades that reflect progress on academic content and progress on habits of scholarship. Every student will have a transcript, the official record of the course work completed by the end of each academic year. Students will have a key role in sharing their progress with their families. Teachers will support students in selecting work and preparing reflections to share with families. Student-family conferences will be held in November and May. Students must take the responsibility for their learning and to see themselves as the key leader in their success. present their work in public presentations and exhibitions of learning. participate in the student-led family conferences in November and April. Students must be fully prepared for their classes each day. Homework does not mean written work only. A day’s assignment may include some written work as well as study and review of class material and preparation for the next class. Ordinarily, a student should expect an average of 1 to 3 hours of homework per night. Parents are encouraged to check-in with their child daily to assure that homework is completed.